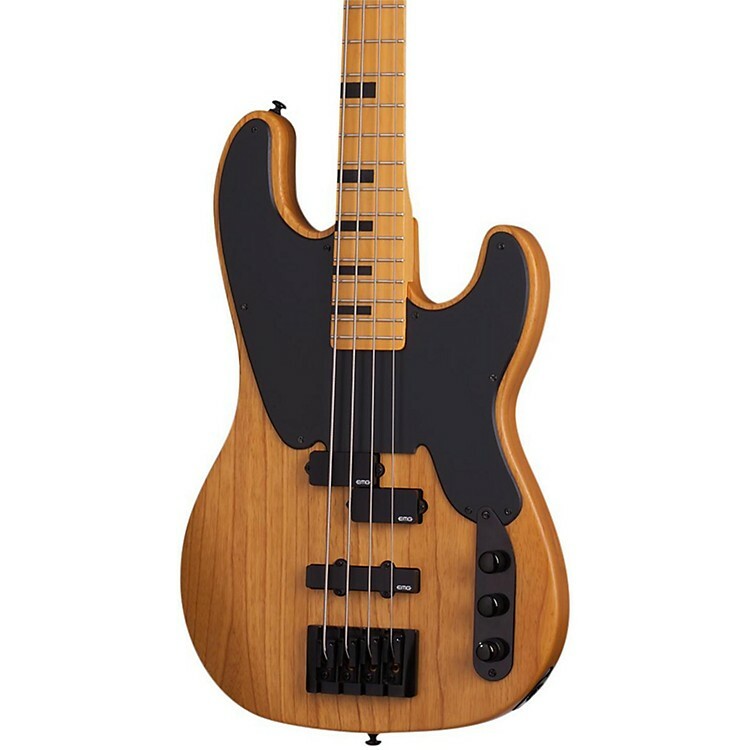 Vintage looks, powerful active pickups and quality components make this an easy choice for any bass player. With classic looks and modern feel, the 2015 Schecter Model-T Session covers all spectrums of tone with a healthy dose of vintage vibe. The Model-T Session was fine-tuned from the ground up starting with the wood selection to electronics and precisely choosing the right pickup to compliment the wood tones. Starting with the active EMG pickups, the bridge & neck are the EMG J and P. Developed for the bassist who needs versatility and range in their sound. The P adds warmth, and incredible low end punch, while the LJ gives tight mid-range punch and dynamic high end response for a well defined attack. The result is the capacity to produce everything from tight slap funk to smooth Motown groove, all with a sound that will set you apart. Schecter took these wiring features and then added the EMG 2-Band Active EQ with 18v system for even more tone shaping versatility. This enables the player to add or subtract EQ at center frequencies voiced specifically for electric bass. The lows are deep, clear, and tight. There are two treble ˜dip switch' frequency centers to choose from. The lower setting is perfect for adding growl and bite to traditional P and J tones. The higher setting provides crystal clear top end to modern-sounding, full-frequency bass tones with punishing clarity without any brittleness. After they got the electronics tricked out, they worked on the construction of the bass. The bolt-on neck joint was reshaped and contoured for smoother access to the higher frets. The neck is bolted down with 6 bolts for a stronger neck/body bond. Carbon fiber reinforcement rods are used in the neck to strengthen the neck relief and preventing any neck shifting. The fretboard features a 12" radius adding a modern roundness to the feel. Precision and durability with classic styling make the Grover 142 series ˜vintage' bass tuners bass machine heads ideal for a vintage look and modern functions. The die cast housing is a sturdy foundation for maintaining center lines of the worm and gear. A fixed bearing surface in the housing creates a smooth tuning surface for easy tuning and 22:1 gear ratio. The safety string post and "elephant ear" button provide utility and a vintage look.